Two troubled homicide detectives race to find a serial killer in a town filled with surgically reformed murderers, in this captivating near-future SF thriller. In a small religious community rocked by a spree of shocking murders, Detectives Salvi Brentt and Mitch Grenville find themselves surrounded by suspects. The Children of Christ have a tight grip on their people, and the Solme Complex neurally edit violent criminals - Subjugates - into placid servants called Serenes. In a town where purity and sin, temptation and repression live side by side, everyone has a motive. But as the bodies mount up, the frustrated detectives begin to crack under the pressure: their demons are coming to light, and who knows where that blurred line between man and monster truly lies. 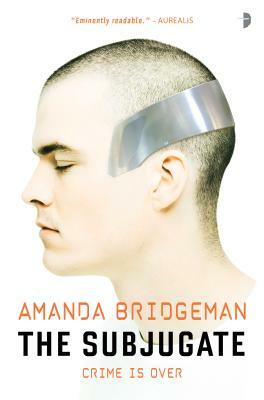 AMANDA BRIDGEMAN is an Aurealis Award finalist and author of 7 science fiction novels, including the bestselling space opera Aurora series and apocalyptic drama The Time of the Stripes. She studied film & television/creative writing at Murdoch University, earning her a BA in Communication Studies. Perth has been her home ever since, aside from a nineteen-month stint in the UK where she dabbled in film & TV extras work.